CodeMeter Cloud offers the ultimate solution for extremely flexible licensing in the cloud. CodeMeter Cloud is fully compatible with CodeMeter Runtime and CodeMeter License Central and uses a dedicated set of the established CodeMeter capabilities. The CodeMeter Cloud solution comes with access to a highly secure and scalable server in the cloud, operated by Wibu-Systems, which doesn’t guarantee just state-of-the-art security, but also high performance access to any licenses you have defined. As is the case with all types of CodeMeter licenses, any license used with CodeMeter Cloud can be created and delivered through CodeMeter License Central. Any integration with existing CRM, ERP, or e-commerce solutions can therefore remain in place. Instead of activating the license in a local CmContainer, it is transferred to a special CmCloudContainer on the CodeMeter Cloud server. Provided they have the right credentials, users can then access the license directly and use it like any local license. Since CodeMeter Cloud integrates with the standard CodeMeter technology and workflows, any applications protected using CodeMeter Protection Suite will automatically be compatible with CodeMeter Cloud. CodeMeter Cloud uses the standard processes of CodeMeter License Central. The main innovation is a novel type of container, CmCloudContainer, that holds the licenses of the user. The CmCloudContainer is bound to a known user and managed on the CodeMeter Cloud server. The end user needs the right credentials to access that container. Only these credentials are stored locally. The CmCloudContainer and the licenses always remain in the cloud, where they can be updated, renewed, or withdrawn by the license owner, and the effects can be seen virtually instantly. One of the great advantages of CodeMeter Cloud is that it aligns the processes on both the cloud and the on-premise side. CodeMeter License Central can be integrated with SAP, Salesforce, or other ERP, CRM, and e-commerce solutions. CodeMeter Cloud also comes with the CodeMeter’s well-known automated workflows for creating and managing licenses. Traditional licensing solutions need users to actively return their licenses if they are to be used on another device. With CodeMeter Cloud, the user can re-use the license from another device without any specific action on their part, as long as it is the same user with the same credentials: the CmCloudContainer is not bound to a device, but to a known user. By defining the number of licenses, the software vendor can determine whether and how often a license can be used in parallel. 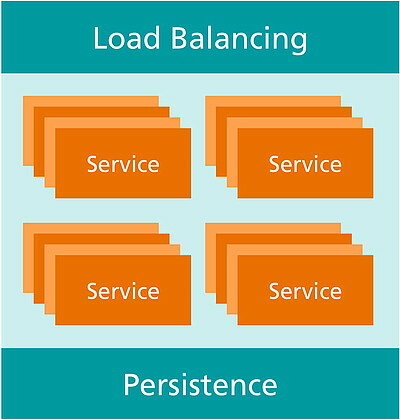 The Load Balancing layer distributes license queries reliably and efficiently, even when several concurrent requests are received simultaneously. As a result, many thousands of end users can send their requests to the CodeMeter Cloud Server at the same time - be it people or machines or applications running on an IoT device. The Service layer handles license management and the corresponding generation and distribution of cryptographic keys. The Persistence layer is responsible for storing data on the CodeMeter Cloud Server. Software developers can continue to use CodeMeter Protection Suite as part of their software development processes and projects. The innovation is that their licenses – and the cryptographic keys that are used for a secure license check – are now stored in a web application. This results in the license always remaining in the cloud throughout its lifetime and the user only receiving a set of credentials. With CodeMeter Cloud Manager, the developer can create and manage the credentials for his end users. These credentials identify the users and give them access to the CmCloudContainers they are entitled to. All the end users will see is the CmCloudContainer they are given access to. More precisely, any access request to the protected software is mediated by CodeMeter Runtime, which in turn sends the encryption and decryption requests transparently to the CodeMeter Cloud Server. How often and at which level such requests are made can be configured as granular as required with CodeMeter Cloud. If a license is missing or access to a specific function is not allowed, the protected application simply will not work and the user is displayed an error message.